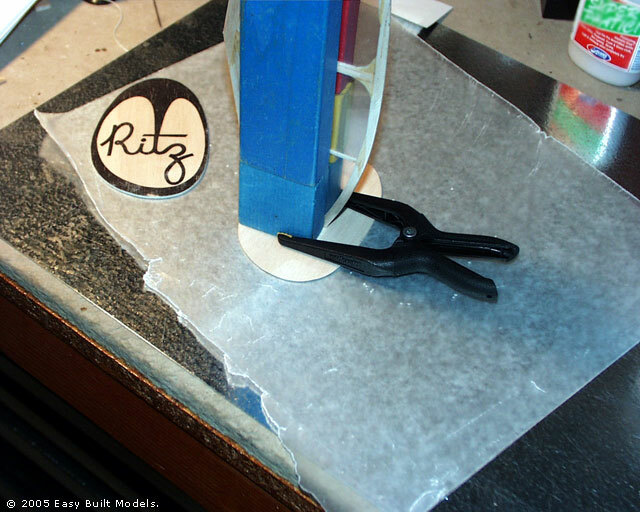 Here is a tip about cutting out small parts that might crack into tiny hard to reglue pieces, such as the small fingers of balsa wood left after cutting out stringer slots. Before cutting use rubber cement to paste some heavy Kraft paper on the back of the printed wood. The Kraft paper will hold all the little pieces in place since the paper has no grain to split. Then later on if there is a split in the wood rub a very thin layer of rubber cement over the front of the split part after cutting. When the cement is dry, peal the paper off the back of the wood, and gently rub with your finger to remove the rubber cement residue. This adds very little weight to the model, but a lot of extra strength. Trace the parts on the printed wood prior to cutting them out, in this way you will have a pattern for a Extra part should you make a cutting error. Another easy way to do this would be to photocopy the printed wood to make your patterns. 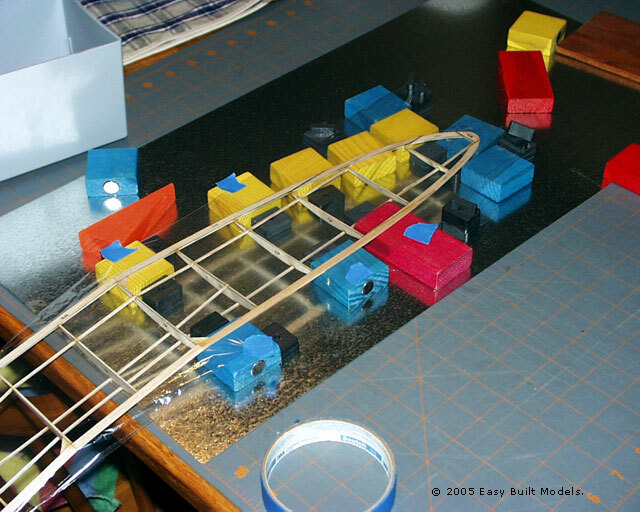 While you are cutting all the fuselage pieces out, some pieces can get lost or destroyed, but fortunately there is a way to keep all the little pieces of strip wood safe from getting lost and in some semblance of order. All that is needed is a sheet of paper, and a roll of double sided tape. Hold the paper sideways, then put a strip of tape across the page near the bottom. You can stick your fuselage-bottom longerons on this strip. Now tape another strip a little farther up the piece of paper, on this you can put the extra uprights from the cabin area. Make another strip for the top-longerons, and then one final strip for the top and bottom cross pieces. Now you have all the strip wood pieces safe from getting lost. If you put them on in order to build the model it makes things a lot easier. This same system can be used anywhere you cut parts prior to construction. Get some spruce sticks of various thicknesses, 1/16, 3/32, 1/8, 3/8, etc. Cut the sticks into 6" lengths then glue different grades of sand paper on the edges of the sticks. You now have a set of sander blocks to use on the inside of stringer slots. Sanding blocks can also be made by gluing sand paper to various sized dowels and lumber trim shapes such as half round, quarter round etc. for sanding hard to reach places like the formers between stringers. 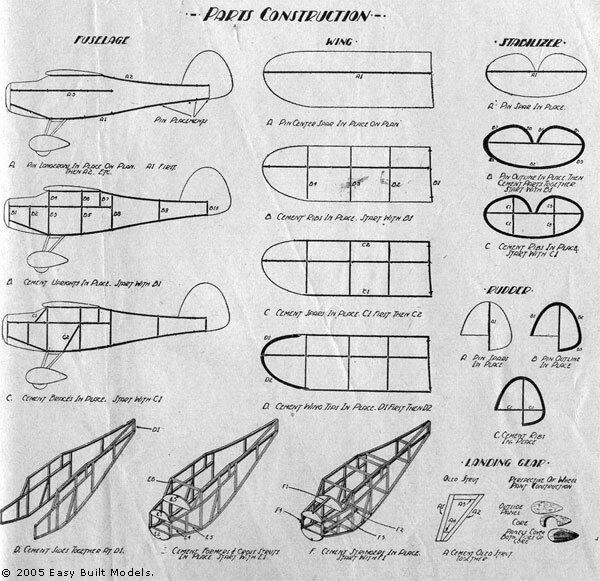 When building a half shell fuselage usually only one side view is shown on the plan. One side is built over the plan, and the other side is built on the first side this can cause a lot of misalignment when gluing the very small areas of the left, and right formers together. These problems can be avoided very easily. The steps to do this are simple. 1) Make a duplicate set of center pieces that the half formers are glued to. 2) If necessary enlarge the notch in the half former that goes over the center pieces. 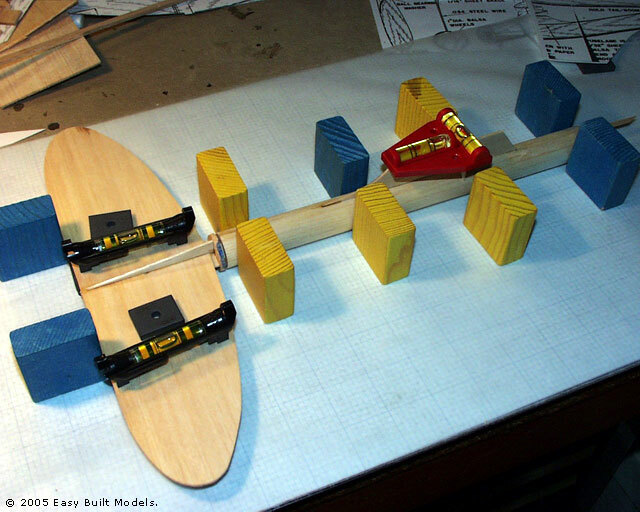 3) Build one half of the fuselage as usual using a triangle to insure that the half formers are trued up at a proper 90 degree angle to the building board. 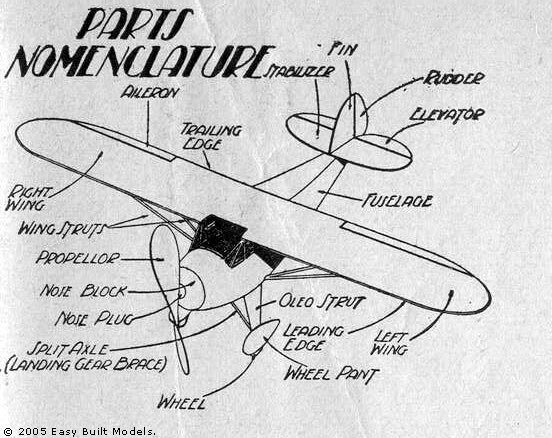 4) Turn plan over, and rub a light coating of cooking oil over the back of the plan in the area of the fuselage side view. This will make the plan translucent so that the other half can be built directly over the plan as the first half was. 5) Glue the 2 sides together along the wide center pieces this gives you a large glue area, and you can use V notched wood, or spring clothes pins to hold the 2 halves together as the glue dries. 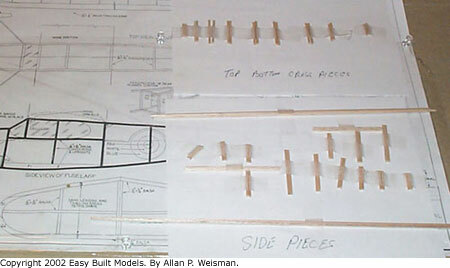 Here is another way to build both sides of half shell fuselages over the plan. Most models of this type build with a right side, and a left side. one side is built over the plan, the other is built in the air, which means one side can be perfectly aligned, the other might be built with warps. 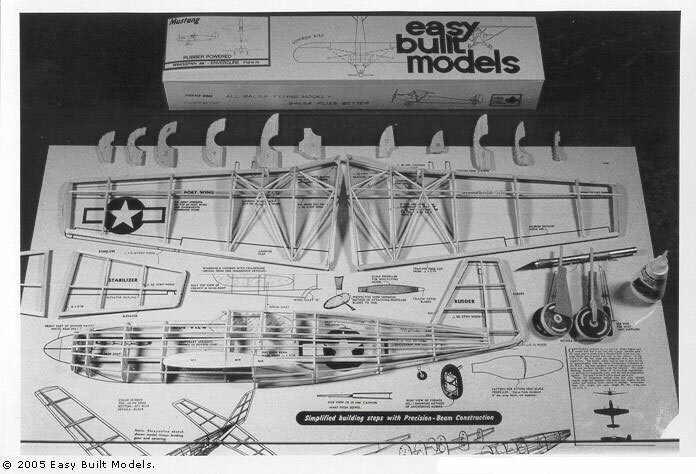 There are some models such as the Easy Built Gremlin which are built as top, and bottom. This type of construction allows you to build both halves over the plans. Converting the side built to top, and bottom built is not difficult. Simply glue the half formers together on a flat surface. Then locate the center side stringer notch (one that goes from nose to tail). Cut the formers apart across the center of this notch, enlarge the notch to take a full stringer in both halves. Now you can build the top half over the plan top view, using triangles to keep everything properly aligned. When it is dry, take it off the plan, and build the bottom half over the top view, using triangles to keep proper alignment. The completed halves can now be joined, completing the construction. If you need small building triangles, take a strip of balsa 1/4" thick, and 1" wide, now use a miter box and razor saw to cut out as many triangles as you need. They can be pinned to your building board where needed. A) Wrap soft wire around the landing gear wire and fix with solder. 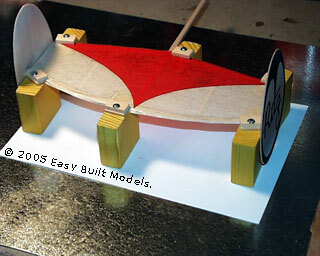 This adds weight, and may imbalance the model causing unwanted turns in flight. 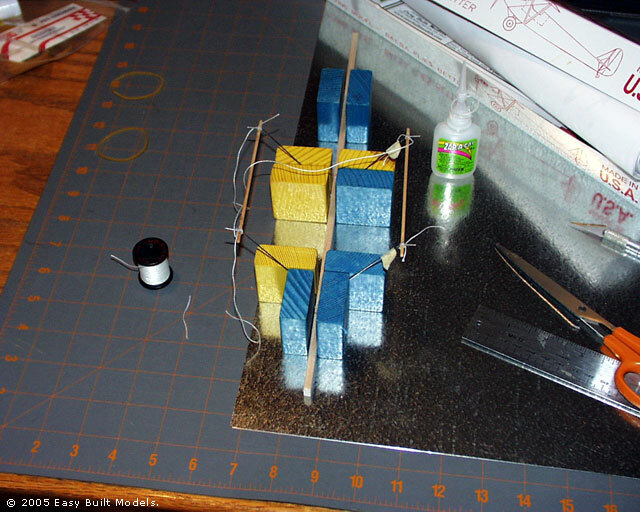 B) Wrap heavy thread around the landing gear wire and fix with glue. This adds less weight than wire, but may also cause imbalance. 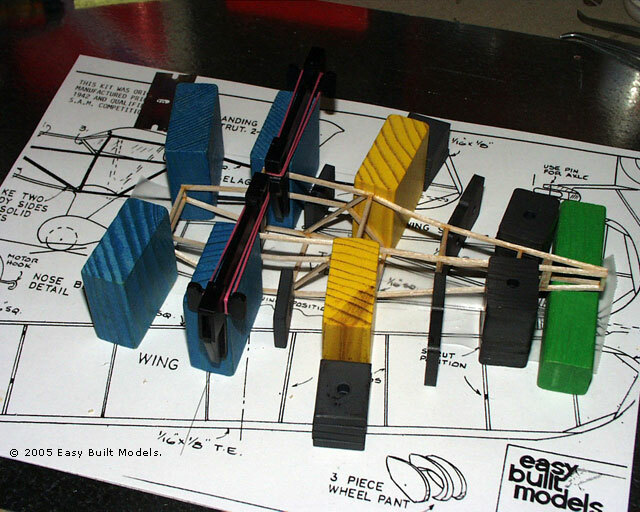 C) Build up a layer of glue on the ends of the landing gear wire. 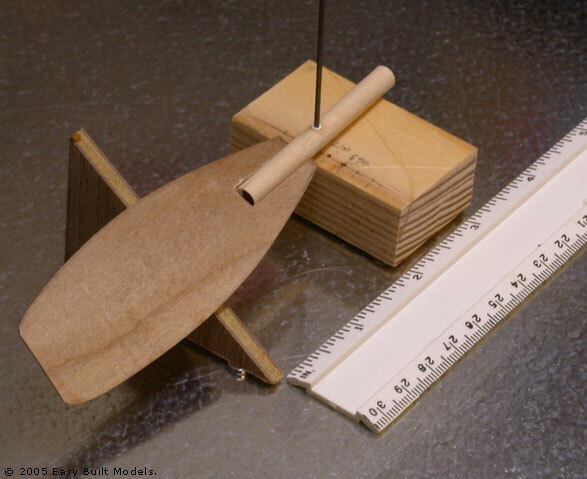 Unless exactly the same weight of glue is used on both sides, imbalance may occur. D) Bend the ends of the landing gear wire. This does not affect in any way but one, it doesn't look good esthetically. 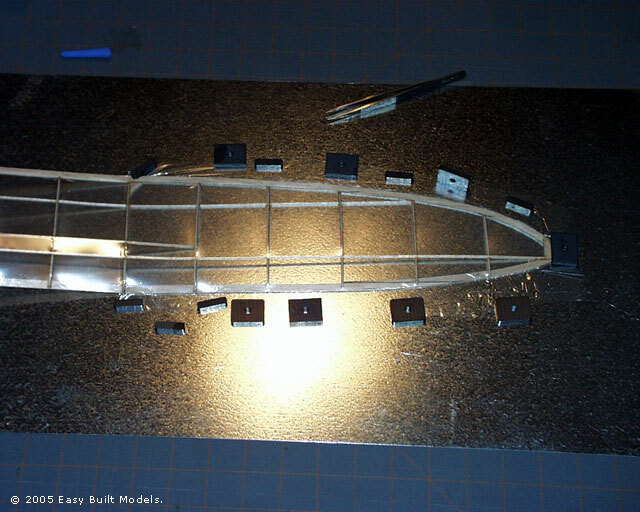 There is an easy way to insure that wing ribs, and fuselage clam shell type construction formers are held at a 90 degree angle to the building board while the glue dries. All that is needed is a supply of triangles that can be pinned on either side of the rib, or former. 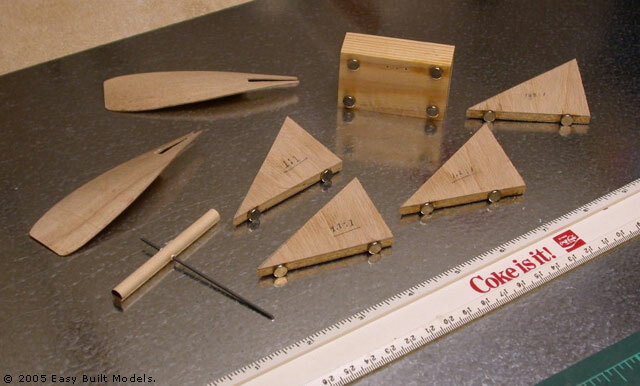 To make these triangles you will need various widths of 1/8" strip wood, a razor saw, and a miter box. 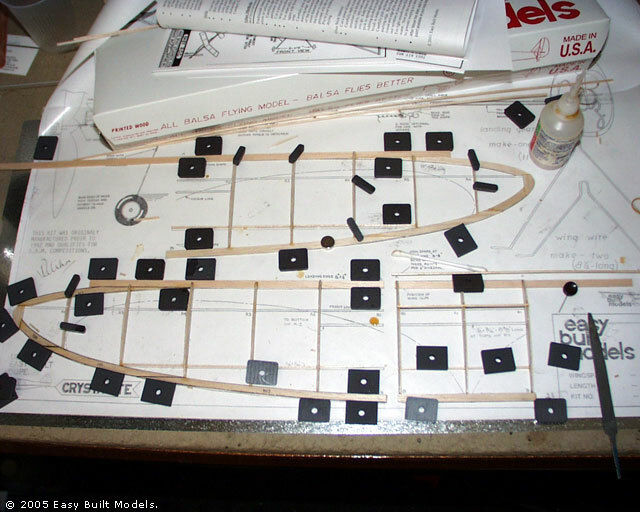 For wing ribs I recommend 1/8" X 3/4", and for fuselage formers I recommend 1/8" X 1", and 1/8" X 2". Simply measure along the length of the wood, and mark off sections equal to the height of the strip. Thus you will have marked off 3/4" squares on the 3/4" wood, 1" squares on the 1" wood, 2" squares on the 2" wood. Then use the miter box and razor saw to cut out a supply of 45 degree right triangles. Now all you have to do is pin 2 triangles on each side of the rib or former to hold the part at a perfect 90 degree angle till the glue dries. 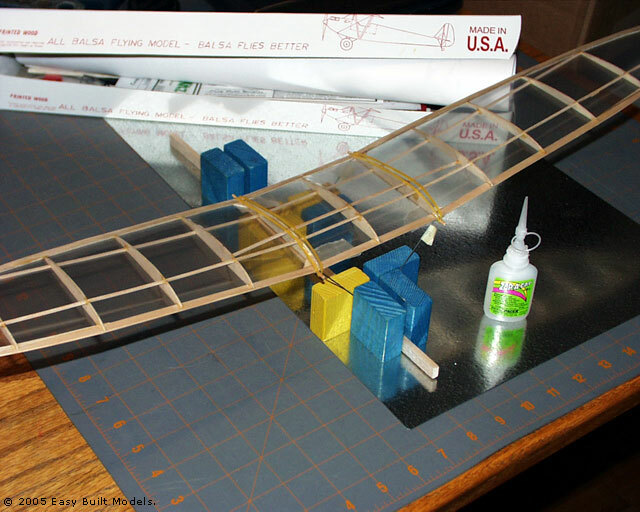 Please note because of the dihedral on some models it is necessary to glue the wing root ribs at an angle. In these cases simply calculate the proper angle, and use a protractor to transfer it to the triangles used to hold that rib in place. 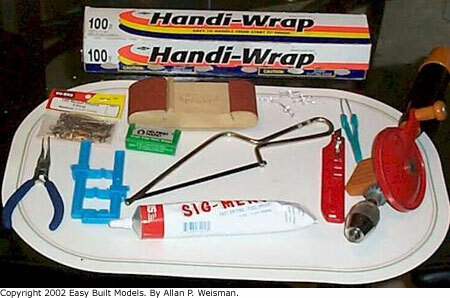 Here is a picture of the basic tools required to build the framework of a model. 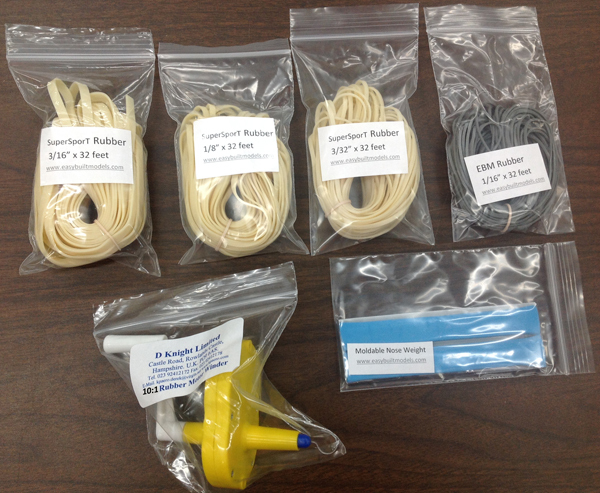 Please note that the items shown are a representative. 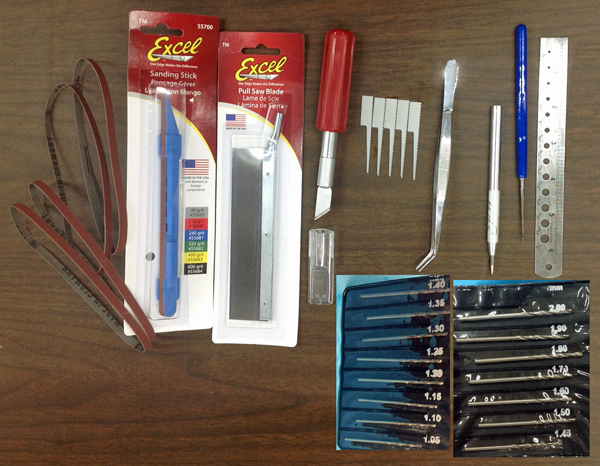 In other words the X-Acto Jr. knife shown might just as well be a #1 knife, and the saw shown might be a coping saw. This picture is merely to give the new modeler an idea of what is needed. PLASTIC WRAP: To cover and protect plans. T-PINS: To pin parts down. SANDING BLOCK: For clean up work, final shaping of nose block, and preparing for finishing. PUSH PINS: To pin plan and plastic wrap to building board. RAZOR BLADES: For cutting wood in straight lines. SAW: For rough shaping of nose blocks. TWEEZERS: For handling small parts. MODELING KNIFE: For cutting curved surfaces. HAND DRILL: For drilling out hole in nose block for prop bearing. PLIERS: For shaping landing gear wire. CLAMPS: For holding parts together while glue dries. 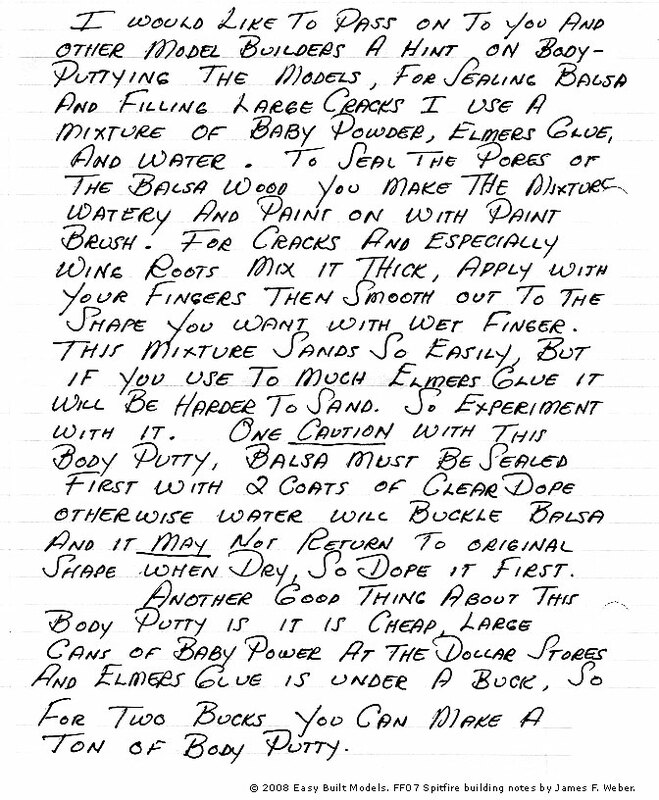 GLUE: For gluing parts together. Some people like using pens and pencils to draw the panel lines. Round fuselages are the easiest to deal with, wind up the motor, hold the pen firmly extended, and while holding the prop carefully bring the spinning fuselage up against the pen. Just kidding, I found making a couple of plastic straight edges from .005 plastic to work good. Some of these are short, some long, some with rounded or square ends. Clear is nice because it allows you to pick up your location. Get a very soft artist pencil, these leave a nice dark mark without damaging the tissue, use these for your reference points when you are ready for inking. Another thing that has worked equally well for me is to enlarge a good, detailed three view to the size of my model. I cut out the various lines and features that I want to mark. Take your copy with the cutouts, make a few extra holes in the copy for catching reference points such as trailing and leading edges on the wing to be marked and then fold the paper over the edges. Lightly grip the structure with the pattern over it and start following the lines you cut. This is great for some of the wild WWII landing gear outlines. Sometimes I will make a little tick for continuing a line that will cross over an open space. This will be completed with one of the plastic rules after I remove the copy paper pattern. And yet another method is using a combination of post-its and 8010 magic removable tape to mask the lines and airbrush your markings on, my favorite, but time doesn't always allow for this. The easiest and most forgivable that I know of was taught to me by Paul Boyanowski. He would take this adhesive film tape, adhere black tissue to it, cut thin strips, remove the backing and apply. This allows for you to carefully position it as you go along. I modified it by using the glue stick in place of the tape and finish with a layer of clear Krylon. Hi, I'll try to give you a real short version of my Hi Gumbandery piece that appeared in both the Flying Aces and the Famous Cloudbusters newsletter called "Twice Twisting Tan II". 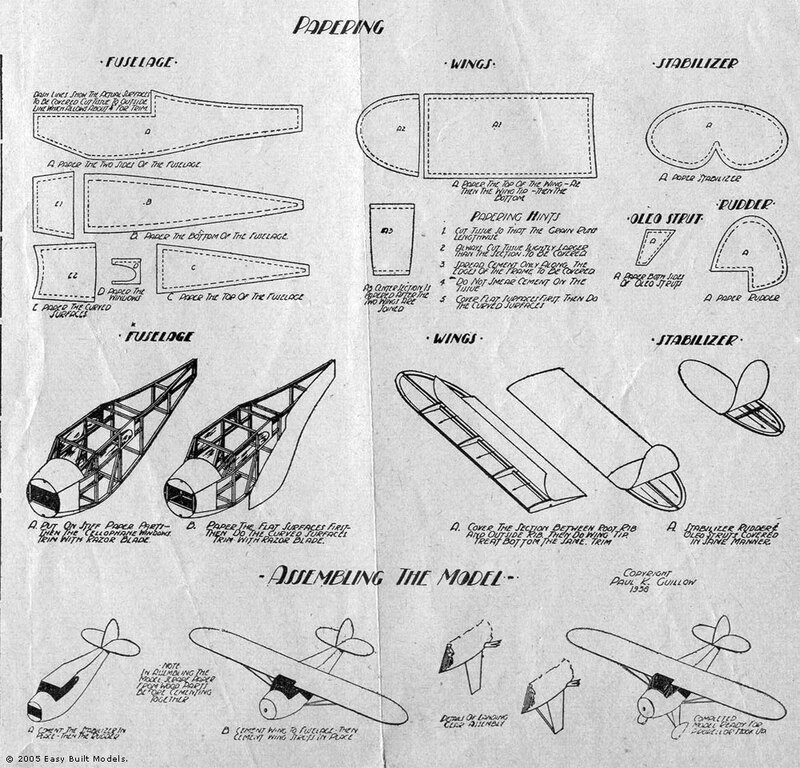 George White made the jigs seen below so that he could make his own propellers. 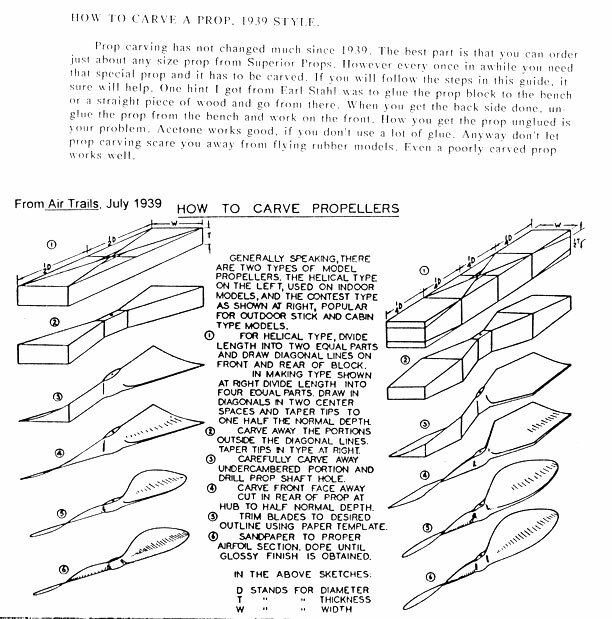 Here is the old fashioned way to carve a propeller. 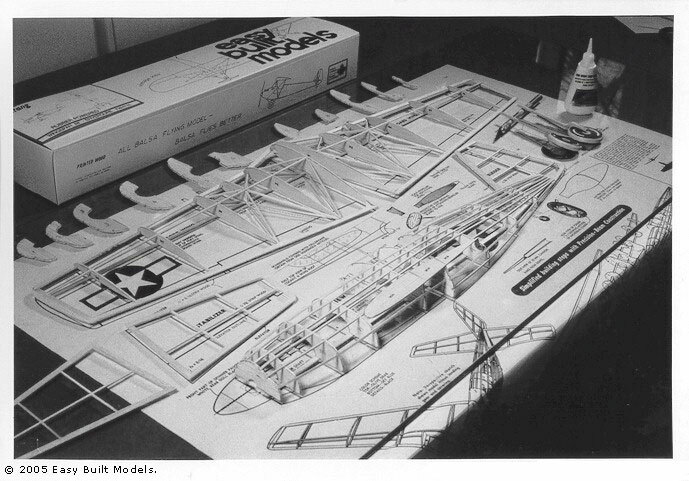 Some still do it this way, particularly when building a model for display. Photos from Steve Kranish demonstrating some ways to build with magnets.